Directions: From Morehead, follow US-60 West to Rt. 3319. Then right 0.7 mile on Bluestone Road (Rt. 3319) to barn on right. Barn is near the road and is easily accessible. 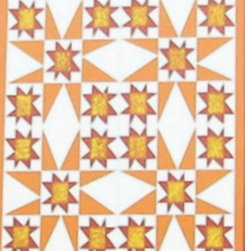 Notes: Pattern was suggested by Foothills Quilt Trail Committee member Rosemary Stokes who had requested that a quilt block be painted with colors of oranges and browns. The quilt square panels were painted first then a location was secured. 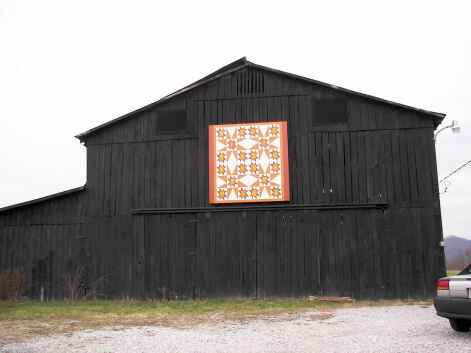 Since the barn owner desired a quilt block, she readily accepted the offer of obtaining this pattern, sight unseen, for her barn. She’s definitely pleased with the results.